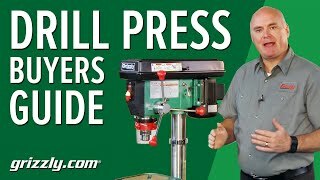 If you use your drill press commercially and need power and capacity, this is one drill press you should look at seriously. Note the 4-3/4" spindle travel! CSA certified meeting CSA C22.2 #71.2-10 and UL 987-8th Edition standards! Table size: 13-5/8" x 13-5/8". Got this drill press in Oct. 2018 along with some other stationary tools and it's flawless!!! I wanted this drill press so I'd have a good table base to mount a drill press table on for my woodworking applications! Very nice too! Skid was too weak to support drill press. Shipping company provided additional skid so it could finish delivery. Drill press is outstanding. I put it to work almost immediately. Works very good. Only thing I would recommend would be a better shipping container. I have pictures of the condition the shipping carton as it was received, if you would would like them. 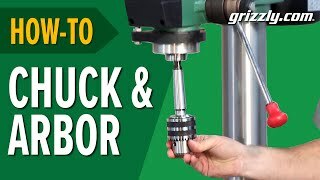 Great drill press. Very pleased with tge whole process. This press is exactly what I needed to compliment my shop. It has plenty of power with the 1 HP motor. Very happy with this machine. This will be used in a Technology & Engineering Education classroom. It cost approximately 1/3 of the price we paid for the machine it is replacing (and that was the price 13 years ago). It is well built, has a more powerful motor than the previous machine, and a larger swing. And it has a safety guard! This will be helpful for use in a middle school classroom. 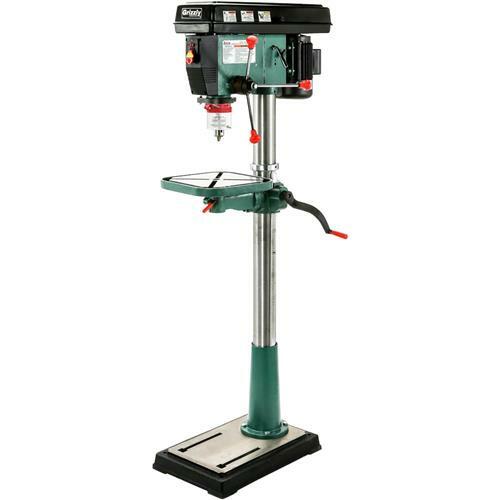 I bought this Drill Press because I needed a lot of bang for my buck. 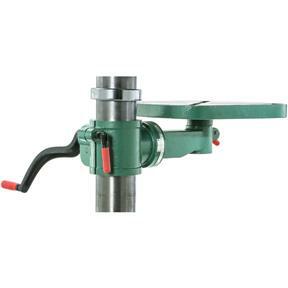 Drilling large holes through wood and steel among other materials. The G7947 has proven to have the power and precision I need at a good price. Way to go Grizzly! 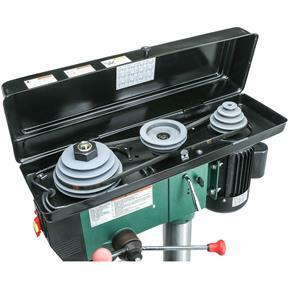 Well constructed solid drill press. Does require two people to put together. This is drill press is almost perfect. I upgraded a couple of things so now I really love it. First was the quill stop. Standard threaded rod with 2 nuts. l couldn't find wrenches that would exactly fit the nuts so it was a pain to adjust. I bought a 1/2 X 20 threaded rod from Zoro. Only a few dollars. Then I removed the old rod. It doesn't thread in just fits in. I drilled out the hole to 1/2" with a standard metal drill bit. Then I bought 2 1/2" X 20 nuts to secure it. Finally, I bought the quick set quill stop from Grizzly. They have an expensive one and a less expensive one. Works perfectly. There is a lever on the right side to secure the motor after belt adjustments. I tried to use if for the first time and there was a clang inside. Apparently whatever is supposed to push against the motor fell off the lever. I called Grizzly. I was told there was no way to get in there and fix it and that it wasn't needed anyway. I haven't has any problems with slippage. I also replaced the standard chuck with a keyless one which is much better and holds just as tight. Great size and Power/torque. Was a Breeze to setup. 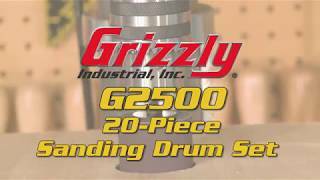 This is another great value product from Grizzly! This was a present given to my dad and he has thoroughly enjoyed this product. 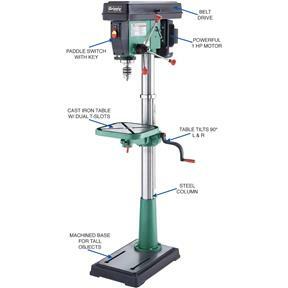 It is truly a beginning industrial-strength style drill press I would recommend this to anyone. This drill press is impressive. It's "Heavy Duty" construction allows usage even in the most demanding applications. I am very pleased with the ease of speed adjustments as well as the ease of table adjustments. The table light is a great feature as well. It allows safer use due to increased visibility while drilling. This machine is with out question, a very high quality product. I am happy to own it ! !